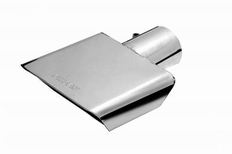 Gibson Stainless Steel Exhaust Tips are the perfect finishing touch for your exhaust system. After all, when your car or truck is being admired, he only part of your exhaust system that gets visually noticed is the exhaust tip! Gibson Stainless Steel Exhaust Tips are manudactured from premium T-304 polished stainless steel to deliver a brilliant "show quality look" that will not chip, flake, or rust like chrome or cheap materials. Gibson's exclusive design features a built-in clampless connection for easy bolt on installation, with embossed Gibson logo.